Because of increasing groups from all over the world we are in need of a guide, prefereably with a language like French, German, Chinese or Korean!!! Full training is given and it is only for an hour or two a week to start with. You will be joining a lovely team, some of whom have been with us for many years. In the first instance contact Peter on 235571 who can answer any concerns or questions. SCULPTURE/SUBTROPICAL GARDEN ATTENDANT from half May - end of September. Job share person for taking money for admission to the Artpark/Subtropical Garden & Pitch and Putt course. Knowledge of gardens, plants, and sculptures are an advatage but enjoyment of people essential. The job entails manning/womanning 3 or 4 days a week sharing with another similar person. 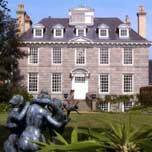 For Sausmarez Manor, You will be conversant with garden machinery (Chainswas, Rideons, Hedgecutters) hardworking and knowledgeable and would like to help maintain and shape an RHS Partner Garden / Sculpture Park. In the first instance, contact Peter de Sausmarez on 235571 or peter@artparks.co.uk with your CV if interested.